Officials believe an illicit hash oil lab caused this mobile home to exploded last week. The explosion peeled the wall back like a scab, exposing all the layers underneath: wood, tattered insulation, someone's home. 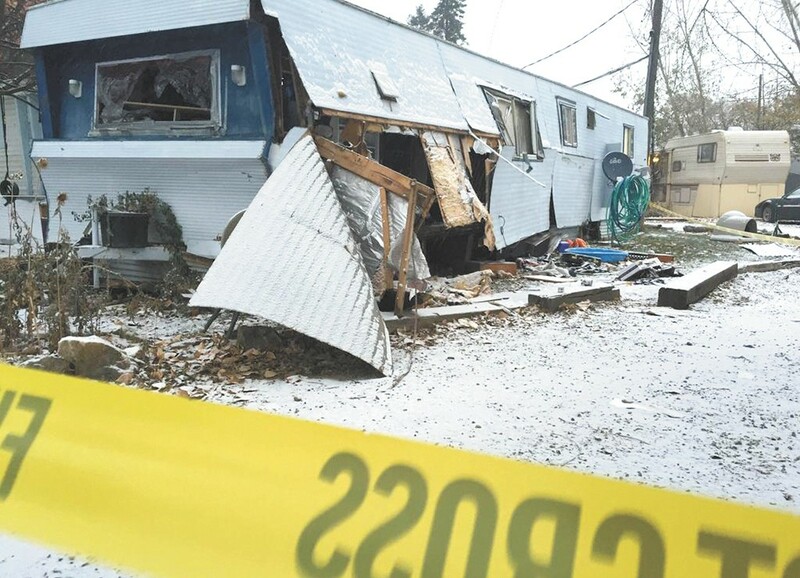 Firefighters responded late one night last week to an East Sprague mobile home park where law enforcement suspects the blast that tore the side off a mobile home was caused by its residents trying to extract THC from pot. Despite the growing acceptance of cannabis, the process used to create pot concentrates — known as hash oil, among other things — is increasingly worrying police and local lawmakers. Manufacture and use of hash oil is "just exploding — no pun intended," says John Nowels, with the Spokane County Sheriff's Office. Nowels says he and other officers have seen more hash oil on the streets in recent years and have begun pursuing more charges for those making the substance. There are multiple ways to make hash oil, but among the most common is to tightly pack marijuana into a tube made of glass or PVC pipe, pour butane through it and then heat the resulting mixture, leaving just a highly potent THC concentrate. That's dangerous because butane fumes are highly flammable and a spark as small as static electricity can cause an explosion. State-licensed marijuana processors can make oils using so-called "closed loop" systems, which keep fumes from escaping into the air, but the medical and illicit markets continue to be a free-for-all. Denver passed a law this month banning the use of flammable substances in home hash oil making. Now Spokane City Councilman Jon Snyder wants to use that as a model for a law here. While explosions can often already be charged as arson, "We want people to know that just because they don't blow something up doesn't mean they aren't doing something illegal," Snyder says. The use of marijuana extracts is twofold: recreational users praise their ability to turn a high into a super-high; medical patients say they're an effective alternative for those who can't or don't want to smoke or who need to use large amounts of marijuana every day. Paul Lugo, owner of the medical marijuana shop Herbal Connection on Garland, says the risks are lower with proper ventilation or equipment, but he still warns patients who ask how to make oils about the dangers. If the city bans hash-oil making, it's unclear what will happen to the supply of the oils for medical patients. There is no licensing system for Washington's medical marijuana growers and processors, so anyone growing or making products for the medical market is already operating in a legal gray area. Medical processors can't sell to the state's recreational stores, and while medical patients can buy from recreational stores, the prices are significantly higher than those at medical businesses. Snyder acknowledges the effect the law could have on medical users, but says he's counting on the legislature to pass new regulations for that side of the industry in the upcoming session. Until then, he sees an all-out ban as the safest possibility.